I think one of the masterpieces of cartooning is the movie Fantasia (1940). One of the great scenes is The Sorcerer’s Apprentice. I have a homework assignment for you! Watch it below and then I have some reflections on it as a parable of our age…and you may have some reflections to add! Reflection: Poor Mickey hauling all that water! I wonder why? Does the sorcerer have a wicked thirst? Is he washing a lot of clothes? Does he use it in his spells? Does he like clean floors? The sorcerer certainly is not baptizing. Nevertheless, Mickey labors greatly. He needs a labor-saving device. 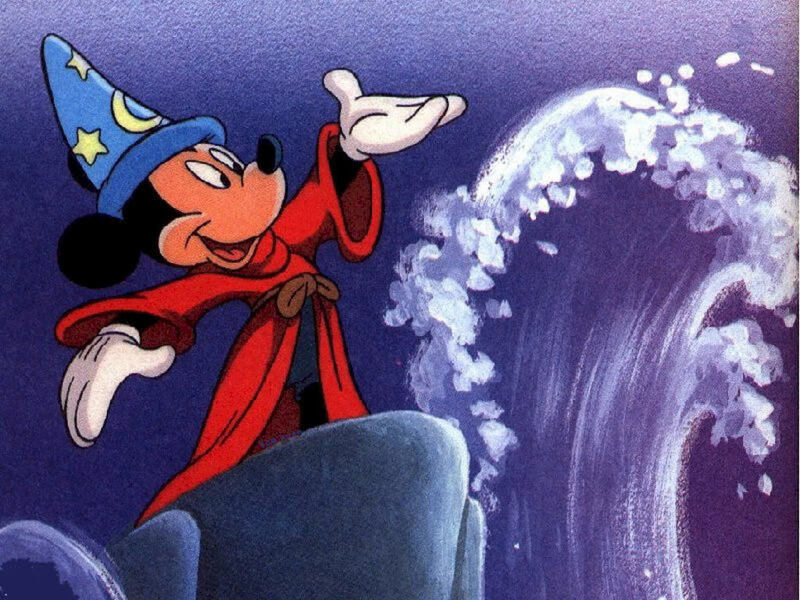 So when the sorcerer after a hard day of conjuring up the demonic and the beatific (interesting in itself), he goes off to bed and a notion comes to Mickey’s head: take his master’s magic hat and then make a broom come to life to do his work! A technological marvel! Don’t we imbue our inventions as almost magical! I’m working on such right now and you are reading on it! It will do the work! It saves us time and money! What is Mickey Mouse’s solution to the technological marvel run amuck? Violence! Ax murder the broom but this backfires as every wood splinter makes another broom (see Steven Spielberg’s “Gremlins”!) Now the threat is the drowning all of Mickey Mouse’s world. In the prayer of the day for the first Sunday in Advent, we pray that the Lord rescue us from the “threatening dangers of sin”, like the deluge of Mickey Mouse’s idolatry devouring him, us all and it has. It’s the end of the world. The Lord’s Word in His baptismal water does drown us to bring us forth dead to sin and alive to God in Christ Jesus (See Romans 6: 1ff and especiallyRomans 6:11) . We can walk wet in His salvation day by day as He is born of Mary for us all. Our tools can be just that, tools, our servants, not our masters, for we have only one Master. Stir up Your power, O Lord, and come, that by Your protection we may be rescued from the threatening perils of our sins and saved by Your mighty deliverance; for You live and reign with the Father and the Holy Spirit, one God, now and forever.